Have you ever wondered what may be your spiritual gifts ? 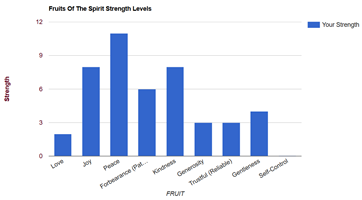 Listed below are some general questions that may help you on the topic of spiritual gift strengths. 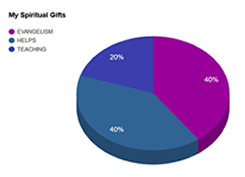 There is NO need to create an account for this in order to get your spritual gifts chart. Note: Even if you are a member and are signed in, this self awareness assessment has been specifically designed for anonymity (no personally identifiable information such as cookies, authentication id's, nor even ip addresses are noted). Assessments are NOT saved to any database so be sure to PRINT your results. Objective: Inspire self-analysis, reflection, and likelihood of perpetual improvement within areas that were perhaps unrealized or in need of attention. Reminder: These few questions are too blunt an instrument to dissect human complexity with laser accuracy. However, these questions are sharp enough to perhaps get you thinking. 1. Making my home a warm and welcoming place is important to me. 2. I like to explain God’s word to others and answer questions about the Bible. 3. I consider myself a handy craftsman or craftswoman. 4. I hunger to see God’s miraculous power over and over. 5. When I study God's word, He gives me speaks to me with insights and gives me understanding. 6. I enjoy spending time with a person during their times of difficulty. 7. I can tell when someone is insincere. 8. I get specific information that God reveals to me that could not have been naturally known. 9. I enjoy sharing the gospel with even a total stranger. 10. Proverbs is my favorite book in the Bible. 11. I believe God will use me to perform His miracles. 12. I enjoy knowing Biblical stories and often help other people understand them. 13. Praying in tongues daily, for me is common. 14. I look for opportunities to pray for the sick and hurting. 15. At times, when I earn more money, I tend to give more money. 16. Using my hands to build something gives me a sense of peace. 17. I like to address the finer details others may have missed. 18. I like to be involved, part of the process. 19. My heart breaks when I see others hurting. 20. Even with my money, I help spread the good news of Jesus Christ. 21. I find ways to give offerings above my tithe often. 22. I’m very sensitive to sad stories and commercials. 23. I am passionate about managing details. 24. I have had others tell me I am a prayer warrior. 25. I like to working with my hands. 26. I am inspired by ministries that start new churches and ministry events. 27. When people sin and seem not to care I get upset inside. 28. Confronting someone about their sin is not hard for me. 29. I can sense when situations are spiritually unhealthy or oppressive. 30. Regardless of the circumstances or situation, God protects and looks out for me. 31. I share verses and Biblical truths with others that they may grow in the faith of Jesus Christ. 32. I pray for the lost almost everyday. 33. Caring for hurting people is very important. 34. I tend to make wise decisions and good life choices. 35. I think about seeing the lost saved often. 36. God has used me to bring healing to the sick and broken-hearted. 37. I enjoy starting new bible study groups. 38. God has used me to interpret another's heavenly language. 39. When I see those whom may be less fortunate, I am motivated to help them. 40. I like to motivate other people to get involved. 41. I spending hours in prayer for other people often. 42. I find ways to encourage other people. 43. I try to come across to others as a loving and caring person. 44. I consider helping others as one of the highest achievements in my life. 45. I like to pioneer new ministry projects. 46. During this time and age, I believe miraculous healing still takes place. 47. It's easy for me to trust God for my daily needs. 48. When people sit around and do nothing, i get frustrated. 49. I can't help myself, I'm constantly praying for situations in the world. 50. I am most comfortable when I lead others, whenever necessary. 51. I like to encourage people. 52. I often connect, care, and coach other people. 53. I am able to delegate responsibilities in order to accomplish tasks. 54. I enjoy when the truth is spoken with conviction and preached boldly. 55. I like organizing social events, gatherings and services. 56. I often make check lists and task lists so I know things are getting done. 57. I enjoy doing the little tasks that others may avoid. 58. Other people often ask how I knew something about them that they had not mentioned to me. 59. I get insights about others while praying for them even though I may not know them. 60. I have people over to my home often. 61. I can see issues or foresee problems before others may. 62. When I'm close by, miracles often happen. 63. Asking God for a list of big things gets me excited. 64. I tend to make total strangers feel at ease. 65. I enjoy serving even when no one notices or rewards me. 66. I often Pray in the Spirit.